Pour 1 tablespoon of the pomegranate juice in circle in center of small plate. In center of another small plate, sprinkle coarse sugar. Turn martini glass upside down and dip rim of glass in juice, spinning back and forth until coated. Then dip rim of glass in sugar, spinning back and forth until coated. Repeat with 2 more martini glasses. Fill shaker with ice; add remaining pomegranate juice, vodka, liqueur and food color. Shake well. Strain mixture into glasses. Garnish with spider rings. 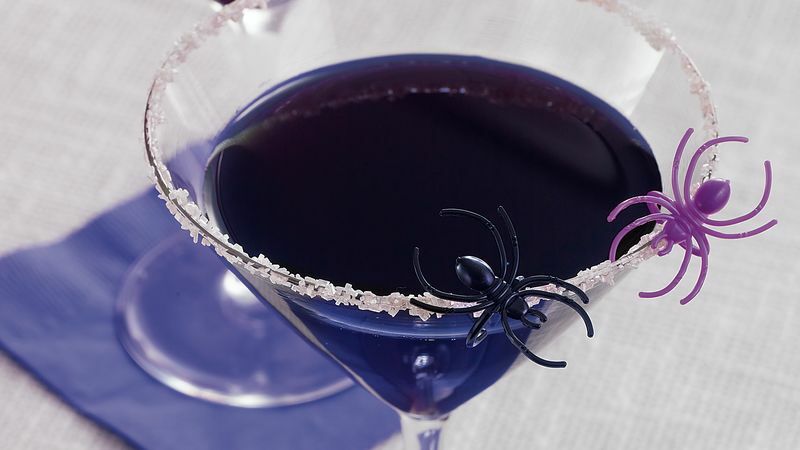 For an even spookier cocktail, dip the glass rims in red decorator sugar.